The benefit of working with a church furniture company that builds everything by hand is that we can fulfill almost any dream you have for your church furniture. 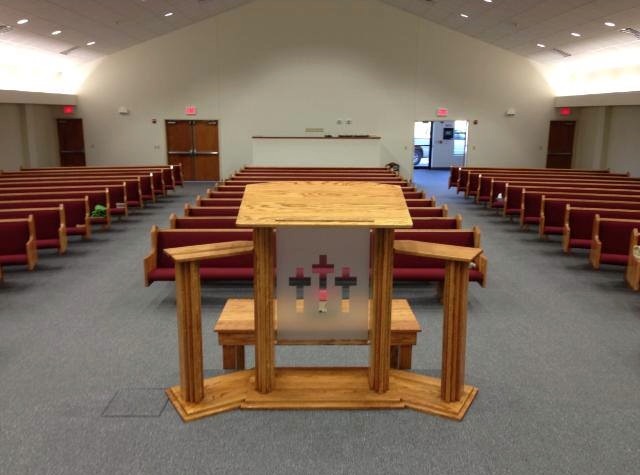 We can build completely custom pieces that aren’t standard church furniture fare and have in the past for churches looking for something special and unique. When you’re redesigning your church, you might want it to look like nothing you’ve seen before and nothing that’s on the market. Handmade workmanship is what you need. Handmade church furniture has a lot of flexibility and benefits. Instead of being stamped out and assembled by machines, each item we produce is made in our woodworking shop. Hands put together and finish each piece of church furniture and that means a lot of attention goes into each one. When you use machines, they can’t spot errors in the wood, the uniqueness of a grain, or the problems with knots or other issues. Hand-working wood is what it takes to make beautiful church furniture. It’s also what it takes when you need something out of the ordinary. If you have an idea for a pulpit or church pews that isn’t in our catalog or what you can find on other church furniture websites, be sure to call us and talk through your idea. We can provide professional guidance to help you make a decision if your idea is feasible for your church and what it might look like in the end as the finished product. We’ve made countless items that were different than standard pulpits and other church furniture and are a good choice for special orders. We take pride in our work because we know it goes on to bring others closer to God and help others develop stronger relationships with the Lord and their community at church. So much happens in church pews so why not make your church furniture as special as your community?